I actually colored this image a couple weeks ago when I took a Copic marker class the evening before my certification. 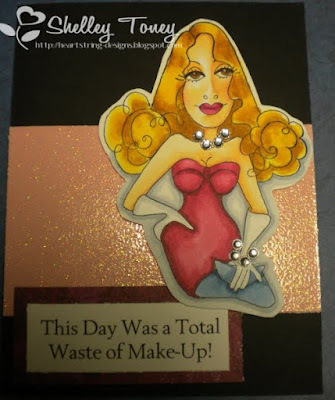 The stamped image is from Loralie Stamps and we all decided it looked an awful lot like Tori Spelling. I liked the humor of my verse...simply because so often it rings true! She is kind of glamorous...what do you think? how cute, always love the details of your faces they are amazing. I agree with the sentiment, I feel that way at times. She is very sassy! I love it. The humor works very well here and it can be true at times. I love it though! I love the colors. The sentiment is SO true some days. Love it! I really like loralie's stamps! I only have one $18 is a bit expensive to me for one stamp? LOL LOL! This is SO awesome!!! LOVE it!!!! !